The strategic design of our new generation of products was created by Spirit Design, thus supporting with this innovative and modernized design the changeprocess in our company. This new and clean layout communicates clearly the strength of High Tech Extrusion: efficiency, reliability and highest technical standards. Due to the puristic shape the new OMNIA extrusion series sets itself significantly apart from competition. Spirit Design became famous by designing the new ÖBB Railjets (Austrian National Railway trains), for the creation of the private Westbahn (Austrian private railway) and for the development of the whole corporate design of the Vienna’s City Airport Train (CAT). Austrias most innovative industry designer is a think tank for smooth mobility. Apart from trains they create anything that can be driven: fire engines, coaches, lorries, sailing boats, ferries, e-bikes, e-cars, utility vehicles and tractors. The airport fire engine “Panther” of Rosenbauer (a company in Leonding, Austria) is the most successful fire truck worldwide. Morever the favourite project of Daniel Huber (Managing Director Spirit Design) is a tractor named “Ox”. The rebirth of a cheap tractor, easy to handle and which can be self-assembled. Its bio gas cylinders are removable and can be used for cooking too. 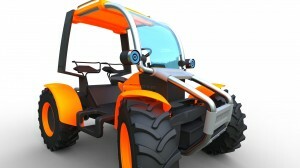 This tractor should help farmers in emerging countries to replace their oxen. Our best wishes for Daniel Huber and his team at Spirit Design hoping that the tractor “Ox” becomes reality. The High Tech OMNIA extrusion line is already in use at several customers, who expressed all their excitement about the possibilities of savings, the new design and the advantages, particularly in cleaning and maintenance. High Tech Extrusion is the umbrella brand name for the four extrusion specialists Theysohn, Technoplast, Topf and Extruder-Komponenten Salzgitter. High Tech Extrusion operates internationally with four production sites in Austria and Germany as well as sales offices in Russia and India. This group of companies, which bundles 30 years of experience in extrusion technology, belongs to HTI, High Tech Industries AG, an international technology group offering high-tech products in the fields of lightweight construction, engineering and energy technology. Renowned companies such as HTP, Gruber & Kaja, BBG Baugeräte and Hitzinger are part of the HTI Group.